Address the flap disc at an angle of 30º to the workpiece for stock removal. Lessen the angle for the final blending passes. Let the flap do the work, use less working pressure than for angle grinding discs for best grinding performance and flap disc life. 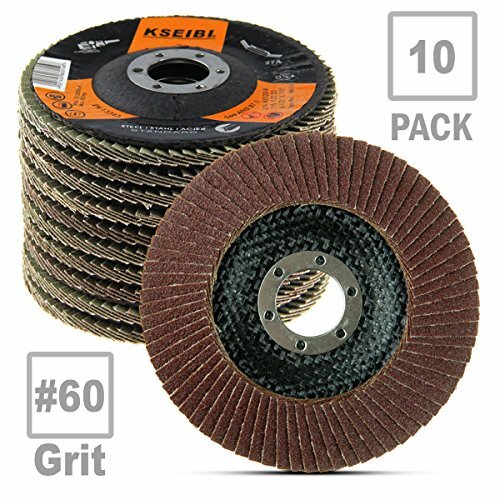 KSEIBI Flap Discs are designed for use on portable grinders and sanders, and are increasingly popular as an alternative to abrasive fiber discs. They complement the use of depressed center grinding wheels, and are the preferred option on light gauge sheet metal or stainless steel where finish is important. Fast stock removal due to the 80 m /sec. operating speed. Aluminium Oxide abrasive is preferred for DIY use as it is the most cost effective product for most DIY applications.